Nottinghamshire County Council has been shortlisted for a 'local government oscar' for its work to rollout superfast broadband to all corners of the county. 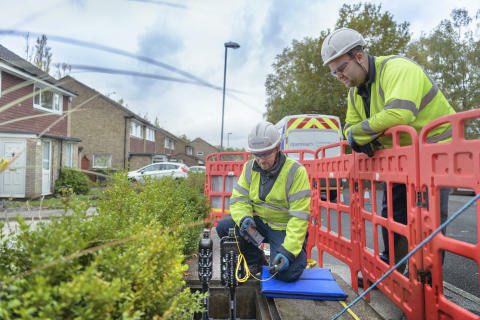 The County Council-led Better Broadband for Nottinghamshire (BBfN) programme, delivered in partnership with Openreach, Broadband Delivery UK and a range of other organisations, is one of the largest infrastructure projects ever undertaken in the county. BBfN has invested more than £30m in the area's digital infrastructure over the last five years, helping ensure that 98% of homes and businesses have access to superfast broadband and making Nottinghamshire one of the best connected counties in the country. Now the project has been shortlisted for a prestigious Local Government Chronicle award in the Best Public/Private Partnership category, alongside entries from Barnet Council and PA Consulting, Bradford Metropolitan District Council, Cheshire East Council, Cornwall Council, Dorset County Council, Glasgow City Council, Hull City Council and Lincolnshire County Council. Councillor Kay Cutts, Leader of Nottinghamshire County Council, said: "I am thrilled that the success of the Better Broadband for Nottinghamshire programme is being recognised at a national level, which is testament to the hard work and expertise of all the partners involved. "The fact that Nottinghamshire has one of the most comprehensive superfast broadband networks in the country is a major selling point for the county when we are competing with other areas to attract new jobs and investment. According to independent estimates, BBfN will be worth £302m to the local economy over a 15 year period, representing a return £11 for every £1 of public and private investment made. "We know that access to good quality broadband is rated by many residents and businesses to be as important as other utilities like gas, electricity and water - which is reflected in the high take-up of broadband services in the hundreds of communities where BBfN has provided access." The winners of the LGC Awards will be announced at a prestigious ceremony on 13 March 2019. Local Government Chronicle editor, Nick Golding said:“The councils that have been shortlisted for an LGC Award are among the most innovative – and their innovation is providing the best services for residents, despite local government facing enormous budget cuts. Independent modelling showed that BBfN will lead to the creation of 8,080 new FTE jobs. Over 227,000 metres of fibre has been laid though the BBfN rollout - the length of more than 2,100 football pitches. More than half a million homes and businesses in in Nottinghamshire now have access to superfast broadband, including over 80,000 premises directly as a result of the BBfN programme since its launch in 2015. More than 50% of homes and businesses have already taken up access to superfast broadband services in the BBfN rollout areas. The high take-up has meant that £2.7m has been returned to the programme by suppliers in 'gainshare' payments and reinvested in expanding the rollout further.